FROM sand to stone, gold, copper and coal, the Clarence Valley has had a resource-rich past. Some of the names like Cangai, Baryulgil and Nymboida will be familiar, while others like the gold mining town of Lionsville have been relegated to the history books. Once a thriving community, there isn't a lot left at Lionsville. A town that popped up around the thriving mines, with tennis courts, a cricket pitch, race tracks, hotels, a police station and more, Lionsville was a bundle of life while the Clarence Valley's gold rush was booming. With Solferino, Garibaldi, Lombardi and Mountain Maid mines among those operating in the Upper Clarence, gold was being dug from our land at a fast rate, mostly by an Italian company. One of the most devastating parts of the Clarence Valley's mining history is the Baryulgil asbestos mine. 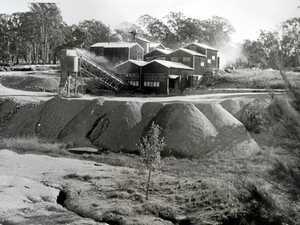 The open-cut small chrysotile asbestos mine was worked by the Bundjalung people. Children played in the mine's tailings, dust permeated through workers' houses and tailings were spread around the community to settle the dust and provide material for roadworks. The Cangai Copper Mine is probably one of the Clarence Valley's most well-known historic mining sites. Nestled along the banks of the Mann River, the Cangai mine was operated by Grafton Copper Mining, 3km east of the Cangai village. With high-quality ore coming from the mine, Cangai became a hub of copper mining from 1904 to 1917. 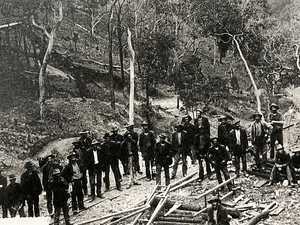 The old Nymboida colliery, which opened in 1909, originally supplied coal delivered by bullock teams to coastal steamers in Grafton. Nymboida mineworkers Frank Smidt, Ossie Turner, Tom Ford and Trevor mcLennan at the end of th shift three days before the first dismissal notices were handed out. The project grew over the years to the point where it had 150 people on the payroll - and supplied 500 tonnes of coal a week to the Koolkhan power station. In the 1870s, prospectors were leaving the Clarence but by October 1872 the Sir Walter Scott Mine opened on the south branch of the Mann River, three miles above Cangai. A gold mining town, there are still remnants of the camp today, with the two streets named Nugget St and Miners St. Still largely off the grid, the camp provided a place for miners prospecting in the area in the late 1800s. Jean Foxover, who wrote a history of the town, wrote that German and Chinese families moved to the area to take advantage of the gold rush. From the 1920s to the 1980s, sand mining was also completed at the site, which involved major landscape changes, especially to the dunes. There was considerable sand mining done in the late 1960s at Minnie Water. In 1977, sand mining was banned. 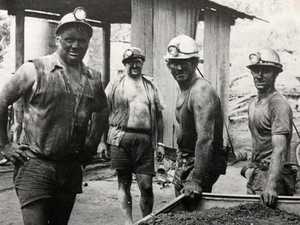 There are reports of mining earlier in the 20th century but official records state it began in the 1960s. Gold was discovered around Dalmorton during the 1960s as mining spread throughout the Upper Clarence. The greatest activity occurred between 1871 and 1900. While documentation of the mining is poor, historical documents suggest there were 85 main reefs mined. The town was bustling with people and had 13 pubs and 5000 inhabitants at the height of the gold mining era. You can still see parts of the town along Old Glen Innes Rd. 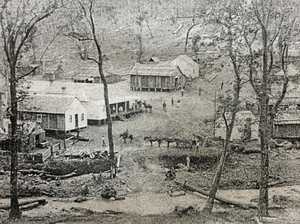 There was a small mining settlement at Bucca Creek, which quickly developed into a mining town of 5000 people. Shafts eventually became unworkable due to the intrusion of underground water and early pumping equipment was incapable of coping with the inflow.